It’s much easier to shoot video than to edit it. 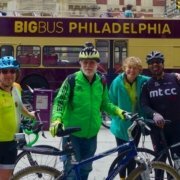 In November 2015 I spent part of a day exploring Philadelphia by bicycle. I shot video of my ride, as I like to do. I ride with a forward-facing camera on my helmet and a rearward-facing one on the bicycle’s rear rack. 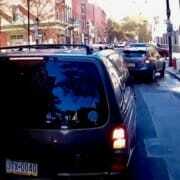 The video accompanying this post was recorded on Spruce Street in downtown Philadelphia. Spruce Street is straight, narrow and one-way, lined with brick row houses. There are a couple of big, old churches. The street has sidewalks on each side and, from left to right, a parking lane, single travel lane and bike lane. 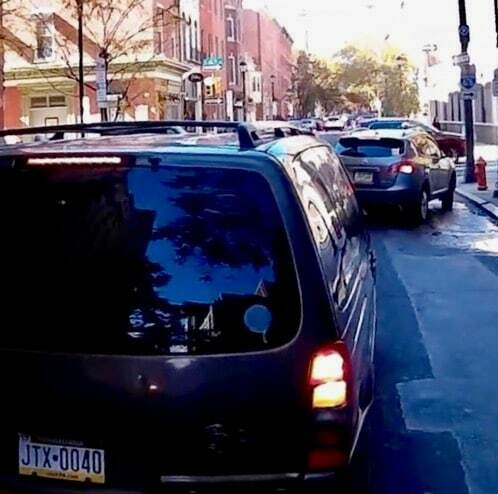 In November 2017, 24-year-old cyclist Emily Fredericks died at the corner of 10th and Spruce streets. 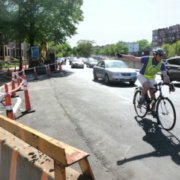 As she rode on Spruce in the bike lane, a right-turning garbage truck swept over her and she went under its rear wheels. Then in December, one block from Spruce Street, a truck turned right and ran over Becca Refford, also 24 years old, leaving her seriously injured. moved me to edit my Spruce Street video and place it online. I can assure you that I wish this post didn’t have to be written. I wish Emily and Becca — and every cyclist — knew what I know: How to protect yourself when choosing to use bike lanes. I want you to understand why what happened to them doesn’t happen to me. 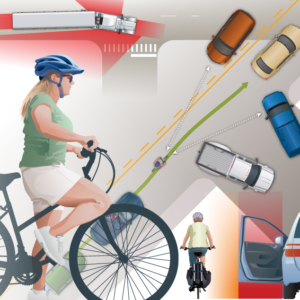 I want you to know how to avoid a catastrophe when you use a bike lane. A cyclist who insists on never using bike lanes is, without question, rigid and dogmatic. But a cyclist who insists on always using bike lanes is equally rigid and dogmatic. My use of bike lanes is pragmatic. I use a bike lane when it works. I get out of it when it doesn’t. The bike lane on Spruce Street is entirely reasonable where it does work. The bike lane is next to the curb — parking is only on the other side of the street — so the bike lane doesn’t create a problem with a door zone or blocked sight lines. When I use a bike lane to either release or pass motorists, I do so with caution — and constant observation of what’s happening around me. Especially when approaching intersections, riding in line with motor vehicles is safer, and often easier. For much of Spruce Street’s bike lane, sight line obstructions are minimized and there’s no door zone to worry about. But the remaining hazard killed Emily Fredericks and put Becca Refford into a body cast. You can avoid this! Merge left to ride in line with motor traffic. It’s easy to communicate with slow-moving motorists. Look over your shoulder and signal to the driver behind you that you want to take your place in the queue. In the video you’ll see me take my place in line. 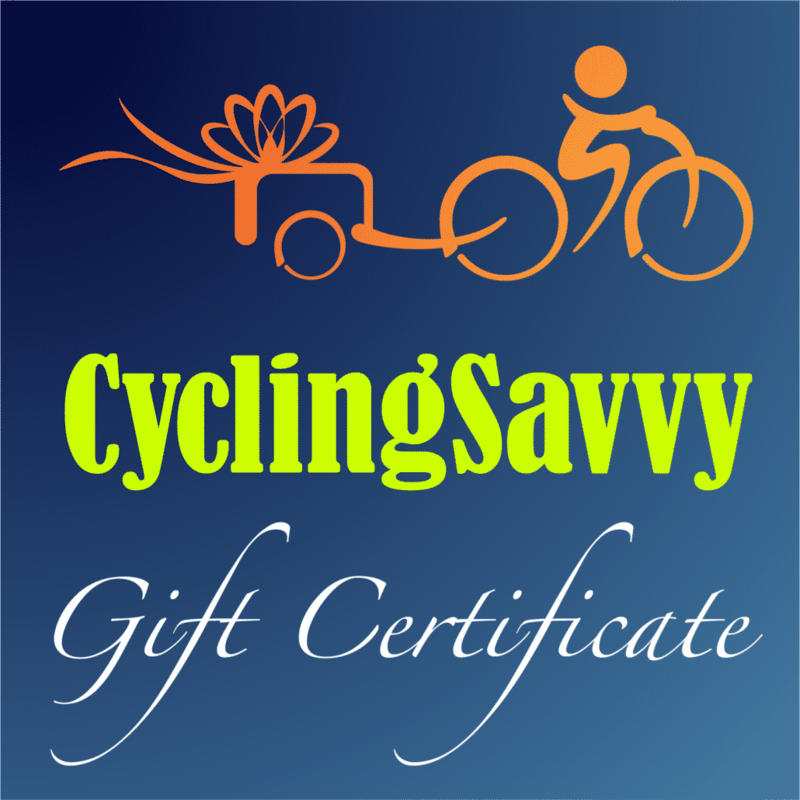 I followed our traffic system’s Rules of Movement and passed right-turning vehicles on the left. Yes, I waited a few seconds longer than some of the cyclists who stayed in the bike lane, but I also could get moving while others were trapped behind right-turning motor vehicles. No motorists had to wait for me before turning right. So this worked better for the motorists too. I rode Spruce Street on a Sunday morning. 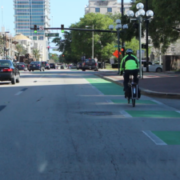 In the video, you’ll see worshipers’ cars parked illegally in the bike lane. I preferred not to get into the middle of a dispute involving politics and religion, so I got into the middle of the travel lane instead, avoiding the door zone on both sides. to get into a bike lane, once you decide it’s OK to use. to get out of a bike lane, once you find yourself in danger. for a post about a couple of encounters on Spruce Street that could have turned into real trouble, and how I managed them. Fantastic reminder John on bike lanes and not letting the “paint” think for you! Excellent, concise and well written. Thank you for writing this. I hope it saves lives. But all intersections deserve respect. Can a pragmatic cyclist get “right-hooked” in such an intersection while traveling along the “top” of the ‘T’? (I hope you can see it). https://www.google.com/maps/@40.6801744,-75.3508172,42m/data=!3m1!1e3!5m1!1e4?hl=en I almost did. Brodhead Rd is a beautifully surfaced, sparsely trafficked road. Driving westwards (right-to-left) I elected to drive on the shoulder. It’s not a bikelane, but there’s no difference in layout. A motorist overtook. Then that motorist stopped in preparation for a left turn at the intersection that’s visible. Another motorist overtook me. How do readers think that 2nd motorist swung on approach to the 1st motorist? Savvy lesson learned. A similar–but much more complex–sequence of events occurred just yesterday. I made sure yesterday’s second motorist knew I was “in the lane”. Gary, am I correct that there was no place to turn right, but the driver nearly sideswiped you when passing on the right side of the vehicle waiting to turn left? Indeed, I avoided that risk by controlling the bike lane, riding far enough left in it that there would not be room for another vehicle to squeeze in between me and waiting vehicles, and leaving the bike lane to wait in line wherever any slow or stopped driver ahead might merge right. The bike lane on Spruce Street becomes a right-turn lane at the end of blocks where right turns are allowed. Some drivers properly merge into it, others not, as shown in the video. Great article. Some updates since the Fredericks fatality – in February of this year, charges were brought against the dump-truck driver for vehicular homicide. Also the parking wars continue between churchgoers and some cyclists. Just last month I saw an event titled God’s Day of Protest Ride, which as far as I could gather was a group of cyclists planning a ride to yell at churchgoers and non-churchgoers who park in bike lanes on Sundays. Another way of saying this: Ignore the “special” paint and pretend it isn’t there. Ride where it best suits. Sometimes it’s the left lane, sometimes it’s the right lane. That labeling of one lane as “special, just for you,” is where the problems begin. Great post and video, John. I happen to be dealing with a group bicycling issue where the pragmatic-dogmatic distinction is just what I need to help make my point. So this was especially timely for me!